1997-98 Research Associate, Music Dept. I was up at Hunter's yesterday, and he said that Rick Griffin called him up and asked him about a title for the record. Hunter said he told Griffin, "Why don't you put a bunch of those palindromic things that you've been doing - 'oxo,' 'mom,' and the others - together?" But if we look at the elements of the "word," that is, take it apart into its smaller pieces, we can speculate. Always a fun thing to do with language. "AO" is the classic abbreviation for "Alpha and Omega," or the beginning and the end. "X" might be interpreted as a number of things: a mathematical symbol meaning "times" (which can also be expressed as "of"; the classic Christian cross; or merely a dividing symbol, meant to separated the "AO" from the "OM". "OM" is a little too big to take on here, but it is the sound which, in Hindu and Buddhist philosophy, contains all the other sounds of the world. The Encyclopedia Britannica has this to say about "Om"
"...a sacred syllable that is considered to be the greatest of all the mantras, or sacred formulas. The syllable Om is composed of the three sounds a-u-m (in Sanskrit, the vowels a and u coalesce to become o), which represent several important triads: the three worlds of earth, atmosphere, and heaven'; the three major Hindu gods..., and the three sacred Vedic scriptures. ... Thus Om nystically embodies the essence of the entire universe." So this seemingly nonsensical word could, conceivably, mean "The beginning and the end of everything." "In ancient Egyptian religion, important symbol in the form of a dung beetle. The Egyptians apparently believed that the beetle laid its egg in the ball of dung, which it rolled to its burrow and consumed; they saw in the life cycle of the beetle a microcosm of the cyclical processes in nature, and particularly of the daily rebirth of the sun. The scarab became a symbol of the enduring human soul as well." X is a mathematical symbol meaning a lot more than "times" or "of" --let's not forget our old variable friend, "X" the Unknown! The first and most obvious theme in the songs is that of the child, or the infant. From the opening track, "Saint Stephen", with its line "Wrap the babe in scarlet colors," to the closing track, "Cosmic Charlie," with its "Go on home, your Mama's calling you," the album is sprinkled with references to children, infants, babies, and childhood itself. And, of course, there is the notably weird song, "What's Become of the Baby?" I believe that all these references, and the use of distinctly nursery-rhyme-like lyrics in some of the songs ("Is it all fall down, Is it all go under? "; "Heigh ho, the carrion crow...") conspire to induce a vague sense in the listener that the album is speaking directly to the experience of childhood, and to the loss of childhood, whether by death or by growing up. This is consistent with Griffin's cover and title. "Dupree come out with a losing hand"
"One-eyed jacks and the deuces are wild..."
Additionally, note the references to the Alice books, where many of the characters are cards. "offer jewels to the sunset"
These minor motifs lend a continuity to the songs which is not quite describable. Admittedly, these motifs are all popular throughout Hunter's lyrics, but their presence here serves a special purpose. I've been visiting your site for quite a while, actually, as long as I've been a fan of The Grateful Dead, and, as every e-mail that I've read on your site starts this way, I must say that it is absolutely amazing, and as a realtively new (I'm 16 years old and have been listening to The Grateful Dead for only around 2 years) Deadhead, it has been a great help in not only understanding the words in the songs, but what they were meant to convey. Also, ever since I've visited your site, I've wanted to contribute something, and I think I may finally have chance to. I'll send more about this later if I find out (more like when, because I know it'll botehr me until I do! 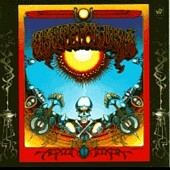 ), but I just found my dad's copy of Aoxomoxoa, and decided that I needed to know what it meant. Surprise, surprise, it's not a real word, so I typed it into a search engine, and the most common thing that showed up was kites. There was nothing about kites on your website, so I thought it might be helpful if I could send something in. I hope you can use this in your website, of course, please feel free to, that's why I took the time to type it up! Also, if anyone knows anything more about this, please e-mail me at: IceFire813@aol.com - thanks a lot!